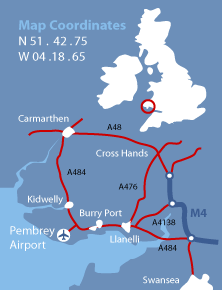 The airport, located on the site of the former RAF Pembrey, is positioned on a scenic coastal plain. It offers easy access to those who visit by plane or by car and is the perfect gateway to both South and West Wales. With road links in the surrounding areas recently upgraded, access to the main tourist resorts, industrial and business centres of South and West Wales, and the ferry terminals at Swansea, Fishguard and Pembroke Dock are all just a short car journey away. Car-hire and a wide variety of accomodation are available within a few minutes drive of the airport.